This sign is posted at the site. Clarification: Bill Hults maintains the transformer that his crew was removing from a roof was not attached to a live wire. 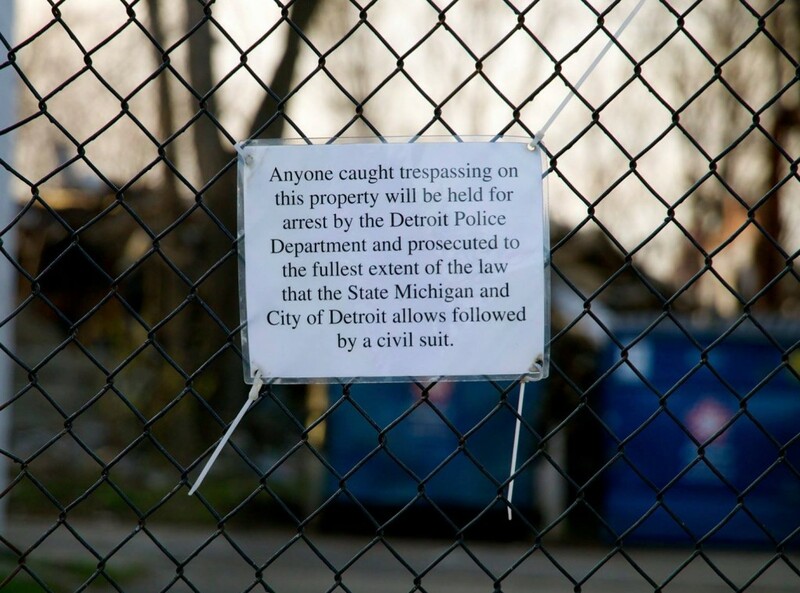 The city of Detroit has shut down an illegal, brazen scrapping operation late Wednesday afternoon following our reports that Chicago-area investor Bill Hults has been illegally scavenging a commercial building that he recently purchased near the Packard Plant. Hults, who was in line to buy the abandoned Packard late last year until he failed to come up with the $2 million price tag, hired scrappers with torches and a hydraulic lift to tear apart the building at 6431 E. Palmer. The scrappers caused at least two fires in the past week and tried to run down a Motor City Muckraker photographer for snapping pictures of the illegal activity. After failing to respond to at least three 911 calls last week, police finally showed up after Mayor Mike Duggan’s administration got involved and ordered the scrapping to stop. Bill Hults owns this adjacent building on E. Grand Blvd. Not long after taking office this year, Duggan showed that he was serious about cracking down on scavengers who have been dismantling the city’s schools and neighborhoods. He successfully urged Lansing lawmakers, for example, to take action on an anti-scrapping bill that had been shelved. Under a state-appointed emergency manager, though, Duggan has no control of the police department, despite his experience as a former prosecutor. When police arrived Wednesday, they found potentially hazardous chemicals at the former Nicro Finishing plant, where scrappers propped up the unstable ceiling with chemical barrels. The scrappers also used a torch to try to remove a transformer from the roof. Hults, who has declined to return our calls for comment, purchased 17 commercial buildings and houses in the Wayne County auction last year and hasn’t paid a penny on his taxes, owing more than $29,000. Most of his properties are open to trespass and are strewn with garbage. Hults paid $18,000 for the E. Palmer property as the top bidder in the auction. He owes $6,098 in delinquent taxes and fines. The Michigan Department of Environmental Quality also is investigating following our reports. Great article, Steve. Keep up the good work. At the same time, Detroit is finally blessed with a Mayor who takes the job very seriously. Did the City Council member from that particular City Council district also get involved? EPA may have been the third call needed to get this stopped. Hazmat chemicals and asbestos? This is a Superfund site waiting to happen. The DEQ is now involved. Good point. If those chemicals were the ones used to finish/plate for the auto industry….they are lethal and should be removed immediately. I would guess cyanide is one of them, as well as cadmium, chromium, acids and solvents. Good God!!! If reside of those chemicals remain I guarantee it will not burn…..it will explode and create a chemical disaster. I was being sarcastic, referring particularly to the asshats jeopardizing the neighborhood. I was not dissing Detroit at all. Sorry if that was not clearly understood. I believe he caught the jist of my sarcasm, he was not hoping for an actual conflagration. Police did find some very hazardous chemical residue. And the scrappers had an open fire going. Makes me feel good about looking into what kind of business was carried out in that building and commenting on it here the other day. Good way to start my day! A key part of Duggan’s campaign was to stop this looting of the city’s properties….why has nothing been done to stop this. How hard is it to arrest these scrappers AND this carpet bagger who owns the buildings. Somewhere, someone in power is in on this…my bet is on CHARLIE BECKHAM, ex felon in charge of the blight program. Why is this site the only place carrying this? I think MCM answered that ….the police dept does not work for Duggan. Errrr, just who do they work for? The police department in under the control of Kevin Orr.